The simple answer is YES! There are many customers that ask this very question. For the past several years the word “wallpaper” was almost considered a swear word! It has negative connotations for many people. Why? So, Why is Wallpaper Making a Comeback? For the same reasons that wallpaper went out of style- it is the reason wallpaper is back-(making a comeback)- DESIGN! The way wallpaper is made has improved to allow for more dramatic designs. The wallpaper itself has improved past the thin vinyl contact paper type that was used in so many homes.years ago. 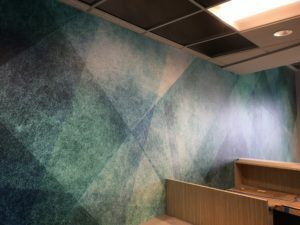 Wallpapers are being made with 100% paper, fabrics, and the proven reliable commercial vinyl wallpaper. To make wallpaper more fun, there are digital graphics, often considered digital murals. What started out as fat heads, has emerged and grown on floral prints, landscaping, and custom designed images such as company logos. With better preparation materials (primers) the removal of wallpaper has become increasingly easier as well. This leads to the fear of removal a thing of the past. Where are wallpapers being used? The better question is where do you want your wallpaper? In the past few years, we have been installing wallpaper on almost every surface in homes and business’. It comes down to your budget as well as imagination. In Chicago, the local JC Licht stores have some amazing designers to help you find wallpaper perfect for your style and budget. Is there any wall repairs etc to make? 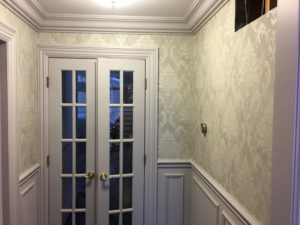 How Much Does It Cost to Install Wallpaper in the Chicago Area? 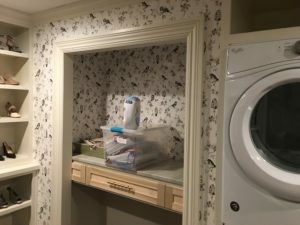 Podcast: How much does it cost to install wallpaper? We can give a range of costs, but you can expect to pay at least $350.00 and it will go up from there. So, what do you do if you want wallpaper in your home? There are a few easy steps you need to take. You will get a written estimate of the cost to install your wallpaper selection. We will give you a timeframe of how long it will take to install and when we can install it for you.